I'm sure that you're familiar with the announcements from Apple's 'It's only rock and roll' event. Hosted at the Yerba Buena Center for the Arts in San Francisco, everyone had read the speculation and today Steve Jobs returned to provide the details. 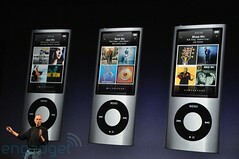 The introduction of new, video camera, mic and speaker equipped iPod Nano, iTunes 9 providing a collection of new features including the ability to share to social networks, and iPhone OS 3.1 which introduces Genius for apps and other improvements.